7:45pm (Local) 29 April @ Suncorp Stadium, Brisbane. BRONCOS 1st | 6-1 for 12 Points, +70. BULLDOGS 6th | 5-2 for 10 Points, +22. 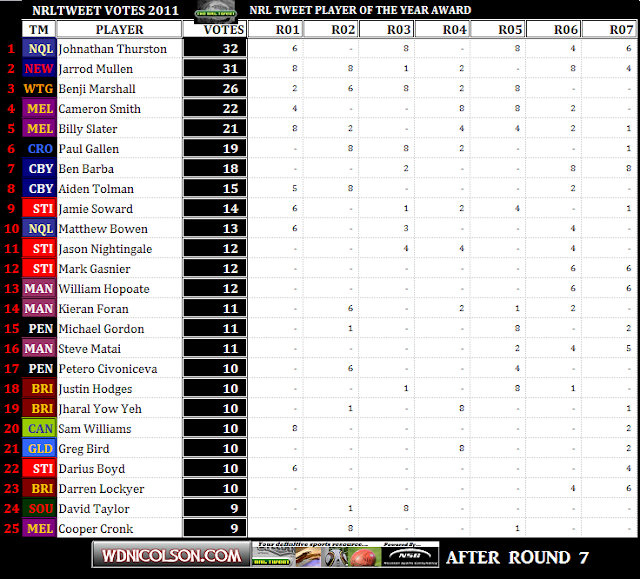 BRI: Beale, Copley, Reed, Hodges, Yow Yeh, Lockyer (c), Wallace, Hannant, McCullough, Carlaw, Glenn, Thaiday, Parker. Bench: Dodds, McGurie, Kenny, Hunt. CBY: Barba, Turner, Morris, Idris, Lett, Keating, Hodkinson, Tolman, Ennis, Paea, Pritchard, Ryan (c), Stagg. Bench: Eastwood, Millington, Payne, Halatau. Brisbane finally forced me to pick them after hurting my tips for the last few weeks... and of course now watch the Dogs win. SMH Late Mail Coming 29/4 - Darren Lockyer will play despite back spasms, and Gary Warburton is 18th man for Canterbury. More Late Mail SNF 28/4 - Gary Warburton has travelled to Brisbane as 18th man for the Bulldogs, while Darren Lockyer is a certainty to play. BRONCOS To Win By 10 Points. 7:45pm (Local) 29 April @ ANZ Stadium, Sydney. RABBITOHS 15th | 2-5 for 4 Points, -56. SHARKS 11th | 2-5 for 4 Points, -26. SOU: Roberts, Merritt, Farrell, Inglis, McQueen, Sutton, Sandow, Ross, Luke, Asotasi (c), Taylor, Tyrrell, Crocker. Bench: Clark, McPherson, Peats, Pettybourne. CRO: Gordon, M Wright, Pomeroy, Best, Williams, Graham, T Smith, Snowden, Aiton, Douglas, J Smith, Tupou, Gallen (c). Bench: Cordoba, B Wright, Flanagan, Bukuya. South Sydney have been below par the last few weeks but get a Cronulla team minus their best attacking players - take the Bunnies. SMH Late Mail Coming 29/4 - Taulima Tautai was a late addition to the Sharks bench last week and could again come on to it for Jason Bukuya who is no certainty to play despite being named for his first game of the season. THere is a tip that Nathan Gardner might in fact play, despite his ankle injury last week. Souths are good to go, with Nathan Merritt tipped to play fullback. RABBITOHS To Win By 12 Points. 5:35pm (Local) 30 April @ Skilled Park, Gold Coast. TITANS 13th | 2-5 for 4 Points, -50. ROOSTERS 12th | 2-5 for 4 Points, -30. GLD: Capewell, Michaels, Tonga, Thompson, Mead, Zillman, Prince (c), Bailey, Friend, White, Bird, Minichiello, Harrison. Bench: Henderson, James, Ridge, O'Dwyer. SYD: Minichiello, J Carney, Aubusson, Kenny-Dowall, Leilua, Anasta (c), Pearce, Ryles, Riddell, Kennedy, Symonds, Nu'uausala, Myles. Bench: Waerea-Hargreaves, Masoe, Friend, Conn, Arona, Graham. The Gold Coast at home are always hard to pick against but the Roosters are ready to fire for mine and they get the tip on the road. SMH Late Mail Coming 29/4 - The Roosters lost Jason Ryles to a hamstring injury with Tinirau Arona likely to get a run off the bench and Mose Masoe will start. Preston Campbell is a good chance to replace Luke O'Dwyer on the Titans bench. ROOSTERS To Win By 8 Points. 7:35pm (Local) 30 April @ AAMI Park, Melbourne. STORM 3rd | 5-2 for 10 Points, +75. KNIGHTS 7th | 4-3 for 8 Points, +33. MEL: Slater, Duffie, Nielsen, Champion, Quinn, Widdop, Cronk, Bromwich, Smith (c), Norrie, Blair, Proctor, Lowrie. Bench: Hinchcliffe, Vea, Woolnough, Lowe. NEW: McDonnell, McManus, Sa'u, W Naiqama, Uate, Gidley (c), Mullen, Fa'aoso, Hilder, Tuimavave, Houston, Paterson, Edwards. Bench: Roberts, Kaufusi, Karawana, Tolar. Melbourne will be hungry to put last week's poor performance behind them and I just can't tip the Knights at AAMI. SMH Late Mail Coming 29/4 - The Storm could still lose Bryan Norrie who is struggling with a head knock from two weeks ago and there may be a reshuffle in the team that could see Justin O'Neill make a return. Newcastle look 1-17. STORM To Win By 13 Points. 7:35pm (Local) 30 April @ Dairy Farmers Stadium, Townsville. COWBOYS 4th | 5-2 for 10 Points, +52. SEA EAGLES 5th | 5-2 for 10 Points, +33. NQL: Bowen, Graham, Winterstein, Tonga, Fai-Fai Loa, Thompson, Thurston (c), Scott (c), Payne, Tamou, Cooper, Hall, Johnson. Bench: Bolton, L Ah Mau, T Sims, A Sims, Segeyaro. MAN: B Stewart, Robertson, Lyon (c), Matai, Hopoate, K Foran, Cherry-Evans, King (c), Ballin, Kite, Watmough, Galuvao, G Stewart. Bench: Robinson, Buhrer, Rose, Mauro, Robinson, Oldfield, T Williams. North Queensland are playing good footy at the moment but so are Manly. This shapes up as a beauty but the Cowboys at home deserve slim favouritism and my pick here. SMH Late Mail Coming 29/4 - With Brett Stewart out again, Oldfield goes to the wing and Hopoate to fullback. The Cowboys still have a doubt on Willie Tonga. More Late Mail SNF 28/4 - Brett Stewart will not play with Michael Oldfield coming in on the wing and William Hopoate shifting to fullback for this game. 2:05pm (Local) 1 May @ Mt Smart Stadium, Auckland. WARRIORS 9th | 3-4 for 6 Points, -13. PANTHERS 14th | 2-5 for 4 Points, -55. WAR: Hohaia, Locke, Brown, Mannering (c), Inu, Mateo, Maloney, Sam Rapira, Heremaia, Lillyman, Brown, Taylor, Luck. Bench: Mara, Packer, Matulio, Ta'ai. PEN: M Gordon, Simmons, Jennings, Tahu, Tighe, Burns, Walsh, Grant, Kingston, Civoniceva (c), Waterhouse, Plum, Fatiaki. Bench: Seluini, Bell, Y Gordon, McKendry, Purtell. The Warriors stunned everyone by beating the Storm in Melbourne and return home to play a Penrith team that had a dig but didn't have any points in them against Manly. Go with the home team. SMH Late Mail Coming 29/4 - The Warriors have given no indication later in the week that Manu Vatuvei will return, so consider the Warriors 1-17. The Panthers will decide on gameday who to cut from their 5 man bench. WARRIORS To Win By 7 Points. 2:05pm (Local) 1 May @ Canberra Stadium, Canberra. RAIDERS 16th | 1-6 for 2 Points, -43. TIGERS 8th | 3-4 for 6 Points, -5. CAN: Dugan, Ferguson, Croker, Thompson, Vidot, McCrone, Orford,Tilse, Buttriss, Shillington (c), Thurling, Harrison (c), Fensom. Bench: Tongue (c), Miller, Learoyd-Lahrs, White. WTG: McKinnon, Brown, Ayshford, Moltzen, Utai, Marshall, Lui, Fifita, Farah (c), Galloway, Dwyer, Fulton, Heighington. Bench: Ryan, A Schirnack, Gibbs, Woods. Canberra are playing a game plan that just can't compete with the attacking brilliance of the Tigers - so even though they are due to win eventually - go with the team that's willing to play attacking footy. SMH Late Mail Coming 29/4 - The Tigers could lose Bryce Gibbs to an ankle injury on gameday but he will travel to Canberra. Matt Orford and Josh Dugan are confirmed starters. 3:05pm (Local) 1 May @ Win Jubilee Stadium, Sydney. DRAGONS 2nd | 6-1 for 12 Points, +67. EELS 10th | 3-4 for 6 Points, -74. STI: Nightingale, Morris, Gasnier, Cooper, Tagive, Soward, Hornby (c), Hunt, Fien, Weyman, Scott, Creagh, Prior. Bench: Green, Young, Merrin, Stanley, Cuthbertson, Rein. PAR: Hayne, Burt, Reddy, Loko, Atkins, Mortimer, Robson, Mannah, McGuire, MoiMoi, Hindmarsh (c), Lasalo, Horo. Bench: Rogers, Shackleton, Allgood, Smith. No Darius Boyd is a blow for the Dragons but Jason Nightingale will excel at fullback... plus there's no Jarryd Hayne for the Eels so you have to pick the Dragons. SMH Late Mail Coming 29/4 - The Dragons expect to cut Mitch Rein and Adam Cuthbertson from their bench if Nathan Fien's hamstring continues to improve, while the Eels may bring in a late change on their bench for Billy Rogers who was not used against the Titans. DRAGONS To Win By 14 Points. ]-[ It's not too late to join our Tipping Competition as long as you're already signed up for Tipping on the Daily Telegraph Website. We use that site because their overall prize is pretty good and you'll be on there for Super Coach anyway. Our League Code is 446386 and you can invite as many people as you want to take on the boys & girls from NOT The Footy Show. 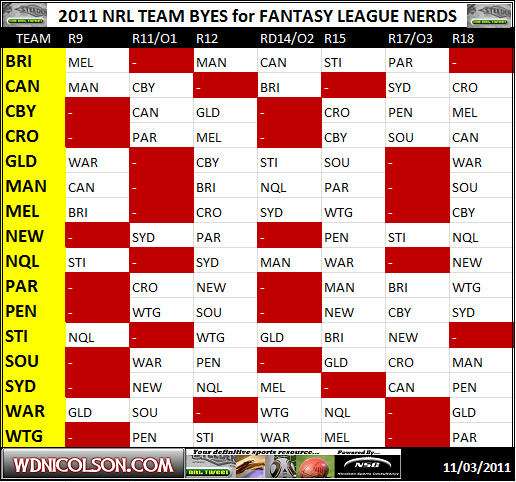 And if you miss the Round 1 Deadline for our Fantasy League - don't worry the 2nd phase begins in Round 10. As an added bonus - here is a Fantasy League BYE Week Cheat Sheet. Especially for the NRL Dream Team, Super Coach or Fantasy NRL minded crew.